Patrolling the streets of Xenon are a robot and a cyborg that want to kill you. Before the robot appears, the music will change abruptly, so if it does, either hide somewhere that it can't see you or leave the screen. Just simply walk away from the cyborg to avoid it. Anyways, take a right and grab the piece of rope lying on the garbage. Afterwards, go two screens to the left, where you will see a car. Open the glove compartment of the car and take the Pocket Pal laptop device you see lying there. Then head towards the pillars on the northern side of the screen. Go behind them and use the rope from your inventory. When the Energizer Bunny crosses the rope, use the hand icon to click on the rope to capture it. In your inventory, take out the battery in the bunny and place it in the Pocket Pal. Afterwards, head north until you find a tank. Examine it, and you will see the unstable ordinance. Take it out and then put it back in. Head two screens to the right. If you see a small panel on the ground that looks like grating, then you know you're in the right place. If not, head a screen north or south until you find it. Once you do find it, go inside it to enter the sewers. Roger will end up in a small room. Take the jar that is sitting on the desk, and then click on the corner of the ink blotter to push a button. Watch / listen to the hologram recording, and when its done, head over the left side of the screen and enter the sewer passageway. Head left until you see a three way tunnel with a grating in the top. When you start to head down, some green slime will appear from the grating and start to follow you. Let the slime follow you until you reach the bottom, and quickly dodge to the left or the right. Then, before the slime climbs back up, use the jar to scoop some up. Head left and then up until you see a ladder leading to a manhole. Climb up the ladder and you will see a Sequel Police ship appear and let out some of the officers. Get out of the manhole. Quickly dash to the right and you will see some of the Sequel Police officers guarding the ship. As quickly as you can, climb into the landing gear. The ship will take off and head for their base. Once the ship lands, Roger will climb out. Head left. Roger will be at the edge of the screen. A Sequel Police officer will be standing there, with a Time Ripper nearby. Then another Time Ripper appears and another officer will get out and talk to the first officer. However, he leaves the Time Ripper open. While they are talking, quickly run over to the Time Ripper and climb inside. Anyways, once you enter the correct code in, you will end up in Space Quest X. A wrong code will either take you nowhere, Space Quest III, or Space Quest I. If you somehow managed to end up here, DON'T GET OUT. This is the volcanic planet of Ortega, and since Roger is not wearing the proper gear, he will melt if he climbs out of the Time Ripper. Instead, head back to Space Quest XII or X.
bird will swoop down and capture Roger. bird drops a dead Sequel Police officer into the nest. nest, squeeze through the hole, and fall down. since they now have his "son" (!). credit card. Pick up the credit card. clothes. Change into them, and then pay the clerk and leave. money, what should you do with it? Spend it! Therefore, ride the conveyor belt to a store called Sacks. the store. Ride the conveyor belt two screens to the right. and pay her 5 Buckazoids. run towards the top left conveyor belt and quickly run away. play, but you get nothing for playing it. keep Roger moving, the blasts should miss him. code you deduced just now. the bar. So now what? the pub and head back to the Time Ripper. Space Quest X, the Sequel Police might come chasing you. code that you wrote down at the VERY beginning of the game? Enter that code to head back to Space Quest XII. Roger can walk through them. that matches the shape you saw, and buy it. Now head back out of the store and back to the Time Ripper. Enter the code for Space Quest XII and leave. screens to the left. Good luck. this code into the door. program. Now you must delete some stuff. you will no longer get attacked by robots in the corriders. Next, delete the brain program. This will start a countdown. since it will make the game exit itself. and throws it into the pit. Then he lunges towards Roger. to knock you over the side, you're dead. 'ROGER JR,' and finally, select 'Beam Upload.' You're done! Now just watch the cutscene. 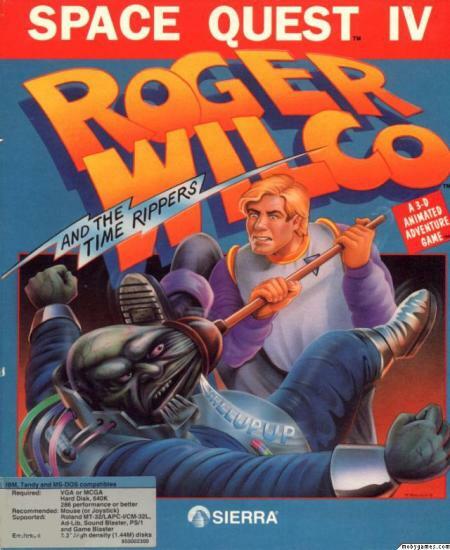 Roger jumps into the time-warp.